Always on the prowl, looking for those young studs who can keep up with her insatiable demands, Cougar has been a stunner since we first brought her out to play. 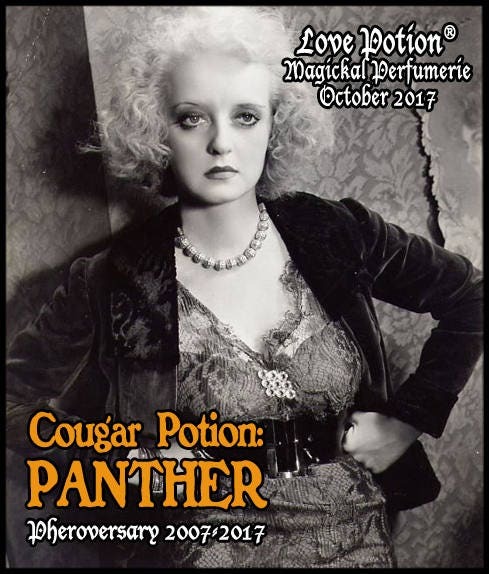 To celebrate her reign, this time we’ve concocted a salute to the Panther, who is just a bit more edgy and definitely walks on the wild side. Black currant forms the heart of this darker variant, blended with hints of red currant and yellow grapefruit then layered with silky hot cocoa powder and dusty white amber. And all the glamorous allure you love remains with a dose of our exclusive STONE COUGAR pheromone blend. This formula was specifically designed to evoke the impression of youthful fertility. Celebrating ten years of the very best scent and intent especially for YOU! It seems like only yesterday we first introduced our series of pheromone-enhanced fragrances, but in fact it has been a decade’s worth of fabulousness featuring cutting-edge scientific enhancements combined with congruent scent blendings for myriad uses both personal and professional. These Limited Edition Pheroversary perfumes are spooktacular spins on our flagship creations...please enjoy with our gratitude for the enduring loyalty of our beloved customers and, as always, add a little MAGIC to your life! COCOA ~ Lightens emotions, evokes feelings of love. GRAPEFRUIT ~ Refreshes and uplifts the spirit, eases exhaustion; beauty and youth glamour. Lends an aura of “sparkle” to the wearer. PEACH ~ Love. Promotes fertility, happiness, and abundance. A symbol of marriage. Longevity, wishes granted.